On a recent morning visit with my friend Eleanor, I sat on the loveseat in front of her warm woodstove and picked up a book from the coffee table. The cover was a photo of a woman in jeans and clogs leaning against hay bales in the loft of a big red barn. 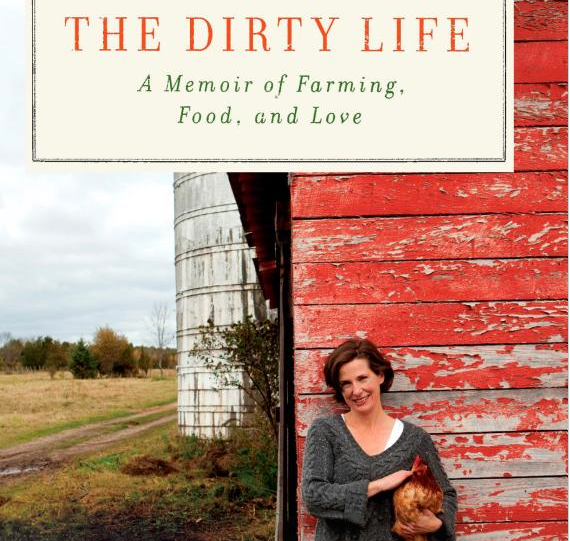 The Dirty Life: A Memoir of Farming, Food and Love by Kristin Kimball, I read. “I’m only half way through, but I think you’ll love that book,” Eleanor said. She went on to tell me the premise. (Eleanor is from Tennessee, so feel free to hear the words in a delectable southern accent.) The author was a stylish Manhattan journalist writing an article on the growing local food movement. She ventured to Pennsylvania to interview a hunky farmer running a CSA (Community Supported Agriculture) and on her first day ended up helping him slaughter a pig in her white designer blouse. Before you know it, she’d fallen in love with the man and his livelihood, trading in her city life for life on the farm. Eleanor read me one of her favorite passages about the author’s visit to her parent’s suburban home for Thanksgiving. As Eleanor read (don’t forget the accent) I closed my eyes and pictured the entire scene unfolding in my parent’s very clean, very white kitchen. I couldn’t wait to read it, but Eleanor needed a couple of days to finish. So I went out that afternoon and bought a copy of my own. I could fill the page with my favorite passages, but I won’t. I will say though, when I finished that book (after two days in which I occasionally forced myself to set it down), I was looking at the world through new eyes. Kristin Kimball’s love for Mark, farming and food were contagious. For the first time in my life, I thought about the rich soil hidden beneath our grass covered lawn and fantasized about a vegetable garden. Her descriptions of the beautifully nourishing meals they created were palpable on my own tongue, and renewed my love and appreciation for the foods we are so blessed to eat. I joined our local CSA and ordered ¼ of a locally raised pig (which was the best bacon we’ve ever had). We trimmed our apple trees in hopes of pressing cider this fall, we’re planting raspberry and blueberry bushes this summer and plan to tap our Maple trees for syrup next spring. We’ve even talked a bit about raising bees and chickens (separately, of course). While most of my changes are newly instituted or future possibilities, Eleanor and her family have been walking that walk for some time now. They drink milk from their cow, Clover, eat eggs from their chickens (or the ladiesas Eleanor calls them) and harvest veggies and fruits from their extensive gardens. In fact, I just got off the phone with Eleanor who reported that their evening meal consisted of their first asparagus of spring and a frittata that was bright yellow because the chickens are free ranging on the dandelions in their pasture. After hanging up, my mouth was watering, and I made a little wish that maybe someday, if I’m lucky, my life can be just as dirty as hers.